So we’re finally in the week before Christmas, a.k.a. prime cookie-baking time. I have to say, I’m quite impressed with the amount of sweets-making and cookie-baking that has been taking place up until now in my house. Also, I think anyone would be impressed with the amount of sweets- and cookie- eating that has been taking place in my house. It’s really off the charts. (Being pregnant during the holidays definitely has its perks, people.) Which is precisely why I find myself in the position of needing to make even more cookies, mere days before Christmas. If you’re in the same boat, this is the recipe for you. It’s different enough from your typical Christmas cookie that it won’t get lost in the shuffle, but it’s also familiar enough that everyone will reach for it on a cookie tray. It’s like a delicious hybrid of a chocolate chip cookie and an oatmeal raisin cookie… with a twist. I love that the cranberries in this cookie are actual cranberries, not just the dried kind (even if your cranberries prove to be less-than-ripe, like mine clearly were). I’m sure you could use those craisin things in a pinch and the cookies would be delicious, but the fresh ones are really great. The dough is lightly spiced with cinnamon, but just barely, so you get a little whiff of it right before you take that first chewy-on-the-inside, crispy-on-the-outside bite. 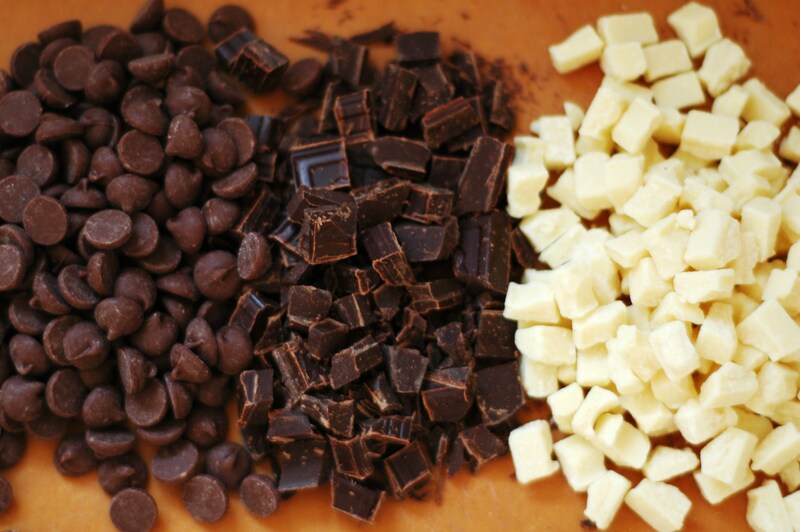 Add three different kinds of chocolate into the mix, and you’ve pretty much got cookie heaven. Position rack in center of oven and preheat to 350°F. Line 2 large rimmed baking sheets with parchment paper or a silicone baking mat. Whisk flour, baking soda, cinnamon, and salt in medium bowl to blend. Using electric mixer, beat butter and both sugars in large bowl until smooth. Beat in egg and vanilla. Add flour mixture and oats and stir until blended. Stir in all chocolate and cranberries. Drop batter by rounded tablespoonfuls onto prepared sheets, 2 inches apart. 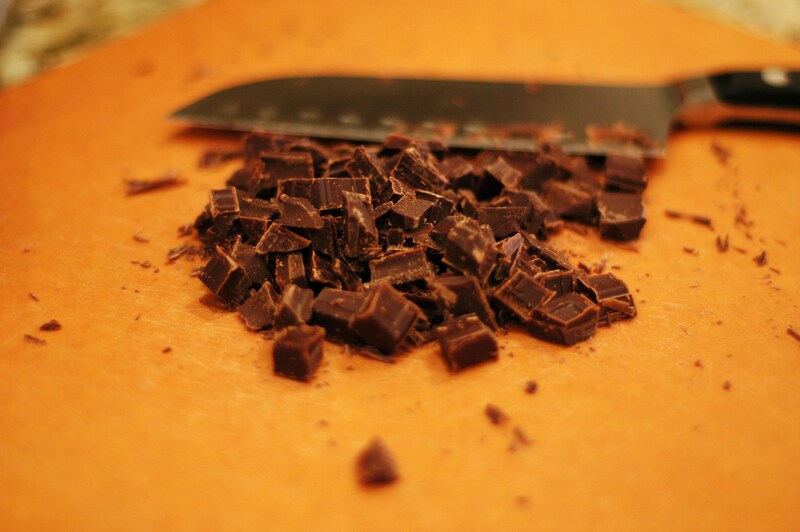 Bake cookies until edges are light brown, about 16 minutes. Cool on sheets for 5 minutes. Transfer to rack to cool completely. bet these were lovely! wondering how does the use of fresh cranberries affect the taste of the cookie..and also does it make it more moist? I’ve only made such cookies with the dried kind.. 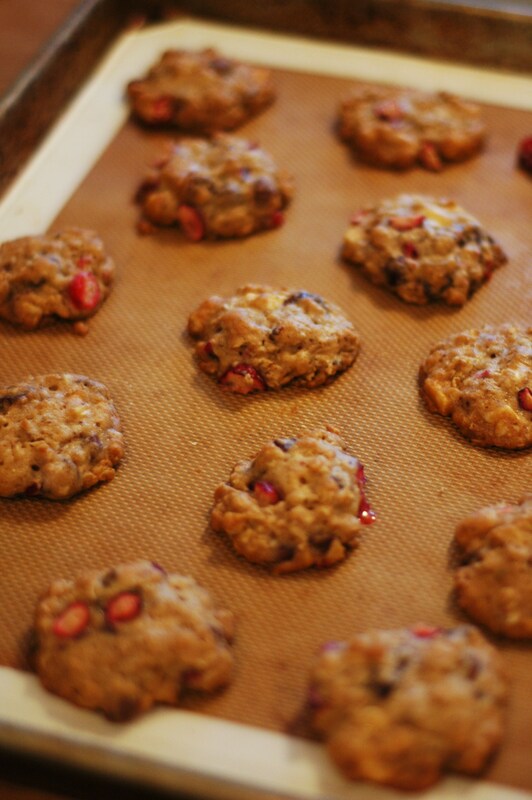 Using fresh cranberries gives the cookies a little more of tart kick. 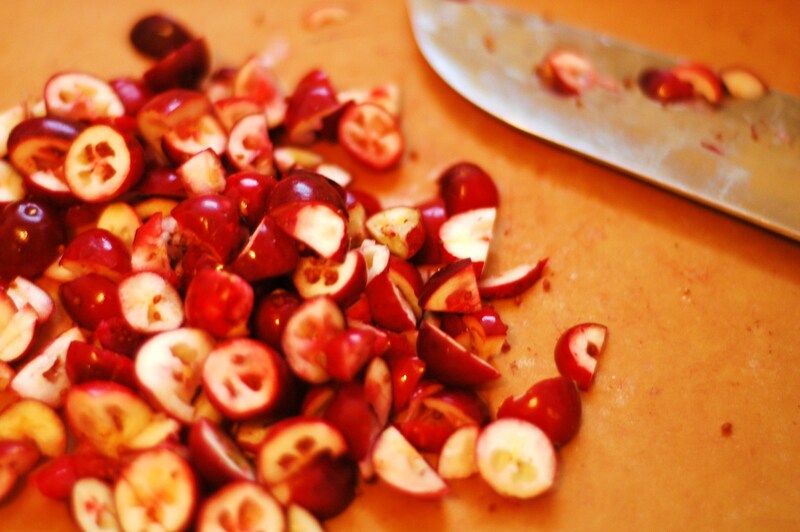 Dried cranberries tend to be much sweeter than fresh because the sugars are more concentrated. I loved the tang that the fresh cranberries gave the cookies, but I’m sure that dried would be great too. 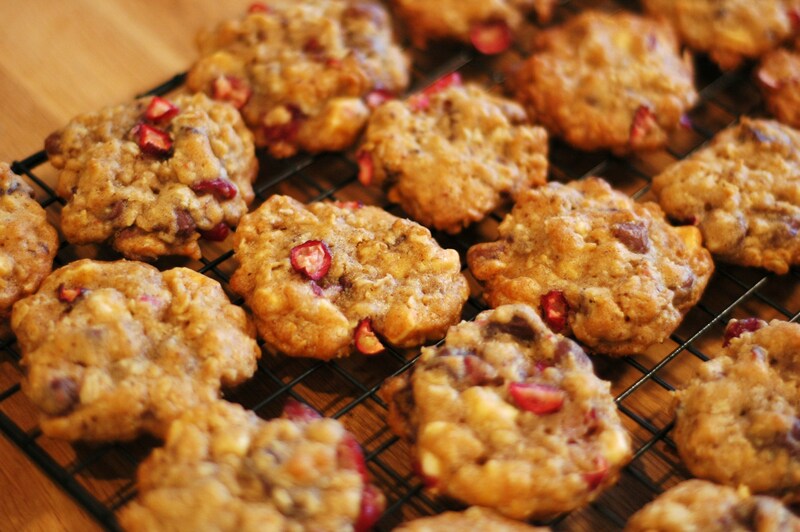 I’m not sure if they are more moist with the fresh, because I haven’t made these cookies with dried cranberries yet, but I can tell you that with the fresh cranberries, these cookies stayed nice and moist in an airtight container for over a week! Hope this helps! 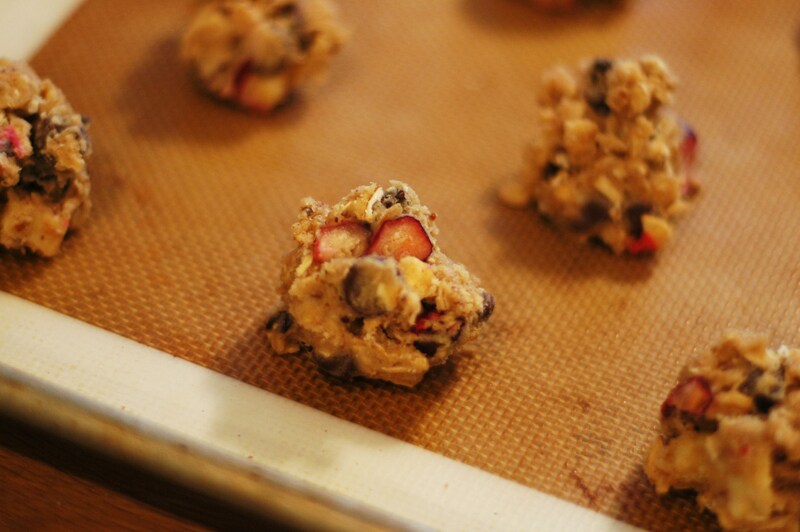 Let me know if you try them with the dried cranberries!